The monthly calendar has turned to June, and with twenty-five merits decisions left going into today, the end of the term is coming into focus. The Court takes the bench this morning with Justices Stephen G. Breyer and Sonia Sotomayor absent. Justice Ruth Bader Ginsburg has the first opinion of the day, in Mellouli v. Lynch. It’s a seven-to-two decision clarifying when a non-citizen, in this case a lawful permanent resident, may be deported because of a misdemeanor state conviction for possession of drug paraphernalia. Justice Ginsburg is wearing one of her more elaborate jabots today, though not the same one she donned in a photo in this morning’s edition of The Washington Post, along with an item about the wedding ceremony — of opera singer Alyson Cambridge and lawyer Timothy Eloe – over which she presided on Saturday. Chief Justice John G. Roberts, Jr., has his reading glasses and is reviewing papers as Ginsburg speaks, always a sign that he may have an opinion to offer today. 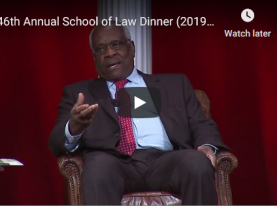 Justice Clarence Thomas follows Ginsburg with the opinion in Bank of America N.A. v. Caulkett, about the treatment of second-mortgage liens in bankruptcy. 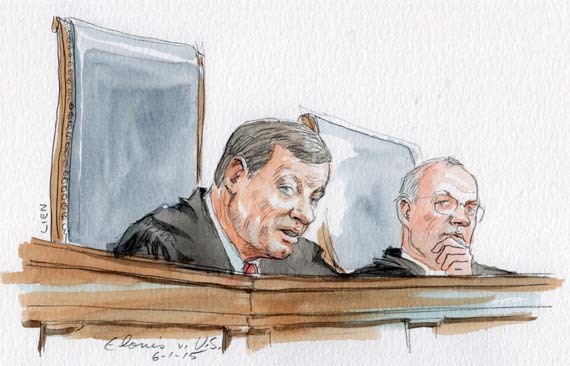 Thomas explains that the opinion is unanimous except to the extent that Justices Anthony M. Kennedy, Breyer, and Sotomayor do not join the lone footnote, which is about criticism of a 1992 decision in this area, Dewsnup v. Timm. Justice Antonin Scalia is up next with the opinion in Equal Employment Opportunity Commission v. Abercrombie & Fitch Stores Inc. Yesterday, the acclaimed Arena Stage production of The Originalist, a comic drama in which actor Edward Gero plays Justice Scalia engaged in an intellectual battle with his Harvard-trained, liberal law clerk, closed for good after being extended beyond its original run. 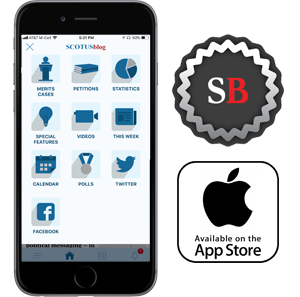 Several Justices attended performances during the run, including Justices Ginsburg and Sotomayor, the theater reports, but not Justice Scalia himself. But the one-man show that debuted in 1986 on a small stage at One First Street Northeast in the nation’s capital is entering its thirtieth season, and still going strong. “This is really easy,” Scalia says before he launches into his summary of the Abercrombie case, to a murmur of laughter in the courtroom. He describes the case of Samantha Elauf, a young Muslim woman who applied for a job with the fashionable clothing chain. Elauf wore a headscarf for religious reasons, and Abercrombie refused to hire her because the headscarf did not comply with the retailer’s “look” policy for store employees, which barred “caps” of all sort. Scalia stresses that “caps” is a quote from Abercrombie’s policy. An eight-to-one majority of the court sides with the EEOC, which filed a lawsuit on Elauf’s behalf. Six other Justices join Scalia’s opinion holding that Title VII does not permit an applicant’s protected religious characteristic to be the motivating factor for an employer. Next up is Chief Justice Roberts, who announces that he has the Court’s opinion in Elonis v. United States, about the federal criminal conviction of a Pennsylvania man who made various threats on Facebook against his estranged wife, unspecified elementary schools, and a female FBI agent who visited him to investigate. Elonis, argued on December 1, is one of the oldest pending cases of the Term, second only to Zivotofsky v. Kerry. Soon enough the Chief Justice moves to the majority’s holding that the Third Circuit’s decision upholding a jury instruction requiring only negligence with respect to the communication of a threat was insufficient to support a conviction under the federal threats statute. He basically closes by quoting not any angry Facebook posters or rappers, but the “characteristically eloquent” words of Justice Robert Jackson from a 1952 case, Morissette v. United States, in which the Court voided the conviction of a man who had taken spent shell casings from a government bombing range because he thought they were abandoned.